Interview with the Boston Globe! My work was featured in the Boston Globe’s “My Instagram” column this past Saturday along with a little interview! Read the whole thing here! Big thanks to Lillian Brown from the Globe for the opportunity! 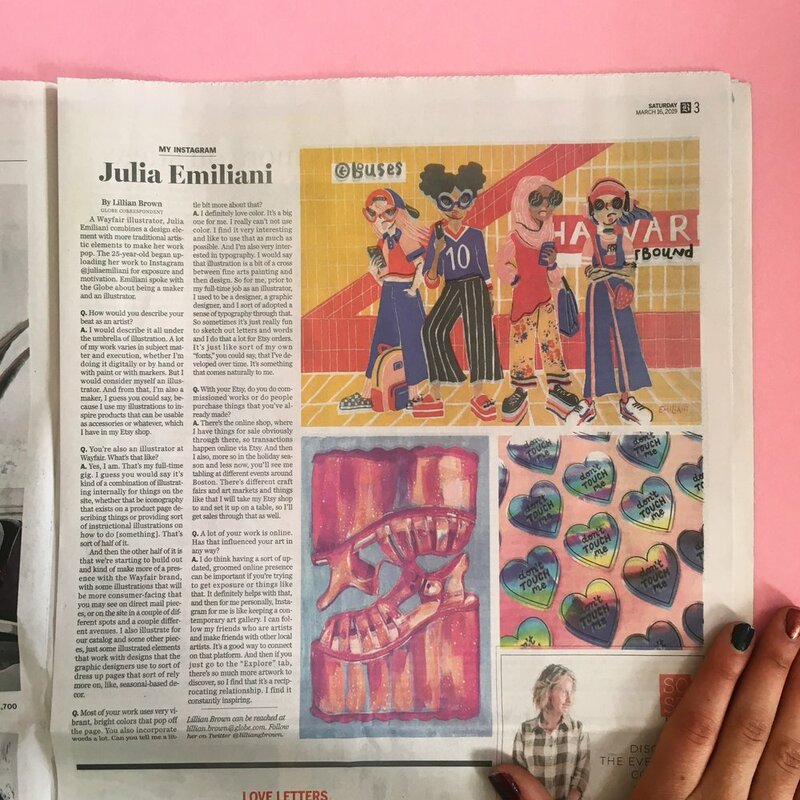 Check out this interview I got to do with Em Mag, an arts and culture online and print publication put together by Emerson College students! I got to talk more in-depth about my art practice, Over it Studio, and the art Boston art scene! Special thanks to Erin Christie for the write up and Brunei Deneumostier for the pics! This past weekend, I had the opportunity to exhibit my first full length (~18 minute) animation at the Institute of Contemporary Art Boston for Culture Club (Part 3), an ongoing series that pairs of DJ sets and live performances with art installations, all taking place on the waterfront of Boston Harbor. The night was such a pleasure to be able to exhibit at such a great contemporary art gallery! After working on the animation for 2+ months, I feel like I gained a lot of insight from the experience. I just felt compelled to write a little bit more in depth about my process and what I learned. It was a really exciting project to work on and also something pretty new for me! As an illustrator, I don't necessarily identify as an animator, so I was initially intimidated by the idea of making an animation that was more than 5 seconds long. But at the same time, I saw it as an opportunity to learn something new and a worthwhile way to push myself artistically and get out of my own head. Because I've studied illustration closely for most of my life, I tend to overthink things quite a bit and am intensity critical of my own work. As a result, I think that mindset ends up stifling my work — I tend to set boundaries in my own head around what is "my style" and what I can and can't do. Over the past few months I've become more aware of how often I do this to myself, so I took on this project with the goal of making something that I could really be happy with and truly fits my vision as an artist. For this, I drew inspiration from artists who before I wouldn't think I "could" draw inspiration from because they could be seen more as painters or fine artists. But really, I love the work of Atelier Bingo, Natalia Vico and Lea Maupetit and drew inspiration from their work and others for this project. Really tried to embrace my love for works that lean abstract and focus on color and shape and a collaged sensibility. My initial moodboard for the piece including works by Atelier Bingo, Nat Vico, Lea Maupetit, Eric Carle, Sally Cheung, Zoran Pungercar, Genevieve Griffiths, Suzanne Saroff, and vintage Italian wrappers. Next, I tried to align the inspiration I gathered to a concept. Eventually, I landed on depicting an abstracted representation of a summer day. Summer seemed like a good idea to focus on; from a more practical standpoint, an animation with a summery look and feel would serve as a fitting backdrop for an event I knew would be outdoors on a summer night. It also was a broad enough topic that could encompass a lot of iconic, beautiful moments like picnics, going swimming, and seeing fireworks. I also liked focusing on summer for the fact that it’s so romanticized. It’s joyful and idyllic and never lasts long enough. That fleeting, ephemeral quality was heightened by the idea of adding found footage of family vacations and informational reels from the 1940s and 1950s. The footage captures a literal moment in time, while the animation captures an imagined moment in time in an abstracted way. The two approaches ended up complimenting and contrasting each other throughout the piece, I think. I spent a lot of time sketching out ideas, figuring out different ways translate objects in real life to abstract shapes of color and texture, and arranging those elements into scenes that viewers could still get a sense of the activity or moment taking place. Cut paper and felt served as an appropriate medium to emphasize color and shape, and I combined those shapes of color with some representational drawings to add variety, contrast, and emphasize the collaged effect. Digitally, I created some more elements primarily in Illustrator. Once everything was scanned into the computer, I created a storyboard based on the shapes I made (abridged version below). Photoshop proved to have the tools I needed to achieve the look and feel I wanted for the piece. I animated each scene one at a time and combined them all together in Premiere. Interestingly, the focus on ephemera in the piece was mirrored on the night the animation played. Since the animation was only to be projected that night, it was a unique moment that can not be repeated. For me that wrapped up this project with a very surreal but satisfying experience. Overall, I’m really thankful to have the opportunity to work with the ICA and all of the other contributing artists that night, including Derek Hoffend, Furen Dai, Vintage Lee, Wez, NomaNomz, and Flee + Dreaveli. I’m also really happy to have the opportunity to take a deep dive into animation. It made me realize the expanded range of possibilities when working motion into drawings, how much I am draw to color, shape, collage, and abstraction and the importance of ephemera in my work. Now I'm just looking forward to seeing how I can apply these findings to work moving forward! If you're in the NYC area, be sure to stop in at Rough Trade New York where the team at Good Blood Creative (@goodbloodcreative) and set stylist Linden Elstran (@lindenelstran) put together an interactive art installation in the Guardian Container! The installation called Twerp Furs is inspired by the artwork made by Ariana Ratner, Emily Yoshida and myself in Speedy Ortiz's latest music videos, so it features large scale versions of the teardrop illustrations that appeared throughout "Lean in When I Suffer!" Check out the pictures below and be sure to catch Speedy Ortiz there tonight, Tuesday April 24th at 7pm and get your record signed!